Bear Creek Front Pocket Holsters are excellent for conceal carry. They are designed to keep your firearm in an upright position in your front pocket. They can be used for primary or back up firearms. Many individuals like them because you can have your hand on your weapon while keeping it concealed in your pocket. You can use the thumb push off at the top of the holster or use the fingers below the grip to push on the tab portion of the holster. Either method allows you to remove the firearm from the holster as it is withdrawn from the pocket. Before ordering a front pocket holster, please watch the video on the back pocket below or on the back pocket holster page of this website. The back pocket holster gives you a two in one holster that can be used as a front or back pocket holster. 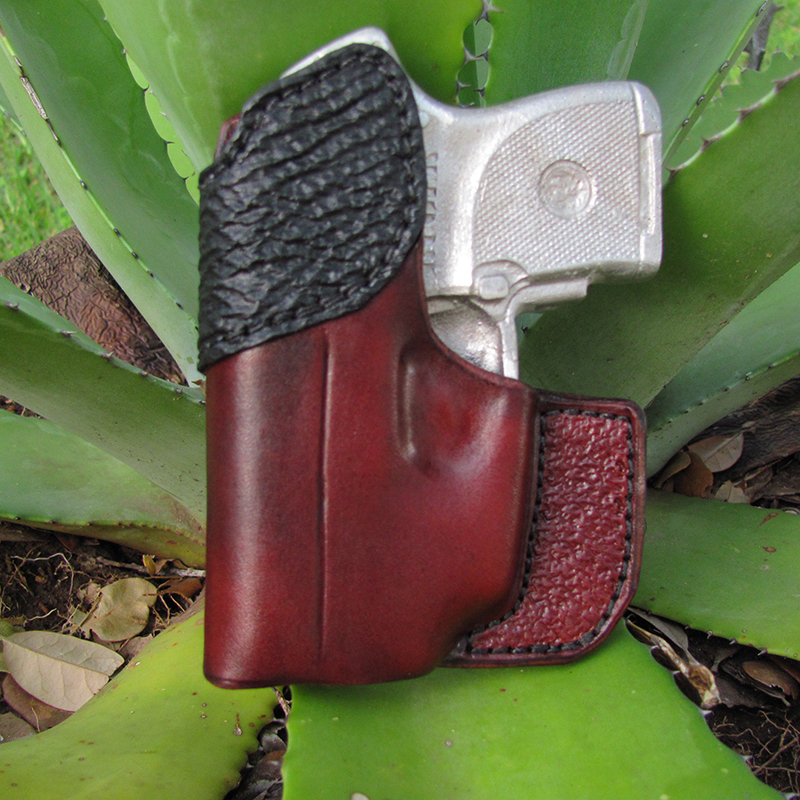 For a small gun, we charge $65 for a front pocket holster (view order form). You get a very nice front pocket holster that is 100% sewn, and no additional charge to sew your holster. It has a thumb push off sewn onto the holster to help with drawing the gun. We spend a little more time stamping the holster to give it some character that also makes it look better in our opinion. The holster is molded specifically to your gun and not a pouch that might accept numerous guns. The molding will give your holster some retention, but will allow you to draw the gun easily at the same time. When drawing the gun from your front pocket, you can hit the thumb push off as your grip the gun. Then we suggest drawing backwards slightly towards your rear end. The tab portion of the holster will catch on the corner of your pocket and the gun will come out, while the holster stays in your pocket. You can safely keep your finger indexed along the side of the gun as you draw. Practice drawing with an UNLOADED gun. Also, do not attempt to re-holster the gun while the holster is in the pocket. Take the holster out and safely put the gun back in the holster. When using for concealed carry you are likely only going to need to pull the gun in a self defense situation, and not drawing the gun numerous times. 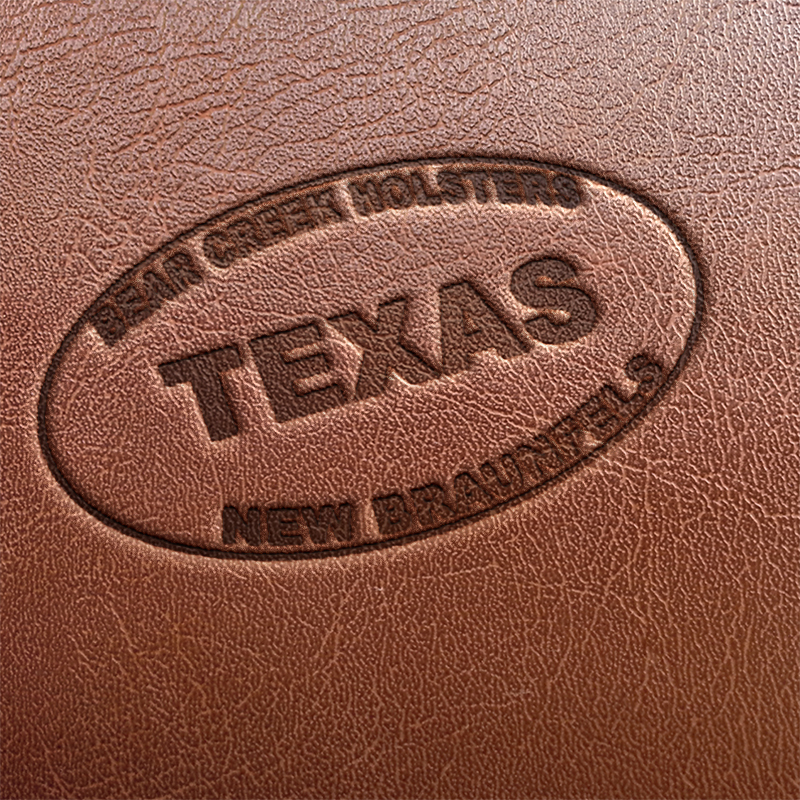 Bear Creek Holsters are also designed to cover the trigger of the firearm as an added safety precaution. We believe uncovered triggers of any firearm while in your pocket, or anywhere on your person, will increase the odds of a negligent discharge. Do not have other objects in your pocket with the holstered gun! You are encouraged to communicate with us on your individual needs. Not all pockets are made alike. What might work well in a pair of jeans, may not work well in a pair of cargo pants. Your holster can be made to fit your specific needs.